ASP Windows and Doors (American Storm Protection Corp.) is one of South Florida's premier impact windows, doors and hurricane protection contractor. We specialize in retrofit and new construction installations of residential, commercial, and high-rise projects. If you are in the market for Impact Windows and Doors, you should know this: We raise the standard and exceed your expectations in impact windows and doors: affordable solutions with superior service. We provide you with smart solutions for protecting your home from natural disasters. We offer energy-efficient impact-rated products that reduce your energy costs and save our natural resources. Our professionally trained staff works to address each detail of the project to your satisfaction. We are fully licensed, insured, and bonded for any size project. We are experts in the field. There is no job too complicated for us. We have structural engineers, architects, and contractors on call to meet any of your requests. Don't be shy, ask. We can help. When we serve you, we give such focus that you will think you are our only client – and that's how we want you to feel. We have worker's compensation for all of our installers. We are family owned and operated. We have specials that none of our competitors offer. Ask about our special of the month. Since the beginning of Prestige Windows and Doors, we have prided ourselves in providing state-of-the-art products, zero-defect workmanship and world-class customer service. We are a local family-owned business desiring to be on the cutting edge of the products we offer and the service we provide. Over the years, we have proven our commitment to our communities and earned their trust to be the number one chosen impact window and door suppliers for the residential and commercial sites. Our professionalism has earned us an unbeatable reputation for supreme honesty and pride in workmanship that stands alone in the industry. We are completely committed to providing you with the most professional, knowledgeable office staff and quality repairs and installations. Whether you are looking for replacements or new construction, or just that special custom door, we guarantee that Prestige Windows and Doors is the finest of them all. From our locations in The Keys, Miami, and Boca Raton we are able to service all the window and door needs of South Florida residents and businesses. We also offer installation by our qualified installation teams. We have extensive experience in residential and commercial applications. Prestige Windows and Doors is prepared to help with all types of impact door and window sales, services and installation. Leading the South Florida window and door market continues today by offering a wide variety of new impact products designed to meet today’s building trends. We are proud to offer PGT, CGI, CWS, Jeldwen and many more. Prestige Windows and Doors is committed to providing you with excellence in door systems that complement your home’s architectural style. Our staff has the attention to detail that can take any space from old and dull to beautiful and restored. Year after year, Prestige Window and Doors introduces homeowners to new styles to elevate their home’s beauty and safety. We at BNT Services Inc. offer an absolute turn key service when it comes to replacing your windows doors. We offer PGT products at a great discount combined with a flawless installation. BNT Services Inc was founded in 2009 by Tom Zeschke and Bret Robbins when they decided to combine their mutual experience to form a dynamic company that offers the very best total experience when purchasing a very important component to houses here in South Florida. Tom Zeschke has been involved in the window industry here in South Florida since his High school days in the early 90’s. He is a former owner of TZ Window Inc that was located in Deerfield Beach and serviced the builders involved in the building boom in the 90’s and early 2000’s. He sold that company in 2002 and worked with a few different companies establishing window divisions for constructions companies specializing in new construction, until the opportunity presented itself to work with Bret and formulating a company with a unique talent for the residential retro-fit market here in South Florida. At Alco Windows and Doors, we know that your home is your biggest investment. We recognize that protecting your family and property is a priority for you and many other Floridians. We also understand that purchasing and installing impact doors and windows can be an expensive endeavor. You should not have to break the bank just to afford some basic countermeasures to the inevitable weather we experience. That’s why at Alco Windows and Doors we provide you with the highest quality impact doors and windows at the most competitive prices in the Miami area. But don’t think that means we skimp out on quality or service. Our business carries the best name brands of impact doors and windows in Miami including PGT Windows and Doors, CGI Windows and Doors, as well as ES Windows and Doors and Eco Windows. We are licensed distributors of these brands, and can bring these revered impact-resistant products to your home quickly and efficiently. Our company prides itself on the timely and professional aspect of our installation services. Because we host a small team of dedicated installers who work closely with company management, there are less overhead costs associated with every purchase. This means we are in the unique position to provide best-in-class customer service at a price that is affordable to you and your family. If you are looking for a local business that is committed to enriching the community and providing a safe environment for all consumers, look no further than Alco Windows and Doors. Buying impact doors and windows in Miami has never been this easy. Sit back, relax, and let the Alco Windows and Doors team provide the service you need. Give us a call and set up your appointment today! Broward County's exclusive window professional! * Authorized Gold Dealer of Fleetwood Doors * Authorized Dealer of Prestige Windows * Authorized Dealer of ES Windows * Authorized Dealer of StoreFront & Curtain Wall * Tecno Glass * Sliding Glass Doors * Curtain Walls * Railings * Window Walls * Front Entry Doors We are the original “Clear Choice” for hurricane resistant Impact Windows & doors. Our group of professionals is the reason you need us to be your supplier of hurricane resistant windows and doors. Clear Choice Windows and Doors, Inc. was established in 1999 to supply hurricane resistant windows doors for Southeast Florida. We are locally owned and operated as manufacturer’s representative specializing in Luxury residential homes. The ownership is actively involved in sales and operations with hands-on, personalized approach to working with clients. Accountability - From sales and operations to permitting and installation, Clear Choice is there every step of the way to assure the job gets done right and on time. Dependability – Clear Choice Windows and Doors has the most knowledgeable and experienced team of installers and service personnel in South Florida. We keep key aspects of our business in-house, so we can maintain rigorous standards and responsive support. When it comes to customer support, on-time installation and quality products, no one is more dependable in the industry than Clear Choice Windows and Doors. Integrity - At Clear Choice Windows and Doors, honesty, dependability, quality and service are virtues we live by. We have one goal in mind – “Customer satisfaction”. Our success and integrity depend on it. Quality Windows and doors – We represent Manufacturers who fully back their warranty and meet or exceed the Florida Building Code for High Velocity Hurricane Zone (HVHZ). At Ediss Construction, we have a combined experience of 23 years in all types of building services including new construction, remodeling & additions, planning & management and energy efficient systems. The kind of door & windows that your home or business has installed can determine just how much of an impact that door will be able to endure in on after a storm. Ediss Construction can deliver the best quality and installation money can buy. Rest assured certified staff will handle each and every project individually with personal attention. We pay close attention to clients’ needs and design ideas, whether it be a new construction or window replacement. Our top priority is quality and the satisfaction of our clients. The world of animation has no boundaries. It is an extremely creative field. We at animation299.com have large number of such animated video creators who put in all their ideas and creativity to make the best desired animated videos for you. At our family-owned and -operated business, JVR Ingrasci Impact Windows and Doors, we offer top-brand impact windows and doors that are designed to provide your property with the highest level of protection against hurricanes and storms. In addition to selling these impact windows and doors in Broward, we also install them, as we are licensed and insured general contractors (Florida State License # CGC-1512448). We have a complete staff that is ready to meet your needs! Our mission is to provide you with strong and stylish impact-resistant windows and doors that will give you both protection and peace of mind. We are also committed to providing you with service that is professional, responsible, and as efficient as possible. We serve customers in Broward, Palm Beach, North Miami, and surrounding areas. Astor Windows provides and installs high-quality, impact-resistant windows and doors. We serve both residential and commercial clients. Founded in 2003, Astor Windows and Doors has rapidly become the best choice for homeowners, architects and general contractors who value and appreciate superior quality installations and outstanding customer service. Our hands-on approach to project management, together with our strong commitment to customer service, sets us apart from the competition. Window specialists can recommend the most suitable type of window for your home, whether louvre, leadlight or sash, and will advise on the best positioning for style, function and energy efficiency. They can also survey existing windows for rot, improper sealing, worn hinges, and foggy double-pane glass, and will tell you whether or not a window replacement or upgrade will be necessary. The professionals in this category are also knowledgeable in sliding doors, bifold doors, French doors and other paned portals. 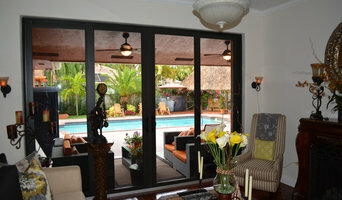 Your window specialist may also work closely with Miami, FL builders and architects. Here are some related professionals and vendors to complement the work of windows: Shutters, Blinds & Curtains, Building Project Managers, Home Builders, Specialty Contractors, Cladding & Exteriors. Find a window professional on Houzz. Narrow your search in the Professionals section of the website to Miami, FL Windows. You can also look through Photos to find examples of windows you like, then contact the professional who is responsible for them.